Etc. Repeat one million times. Then you wonder why kids just out of high school don’t know how far China is from Russia? Ask any number in your town and photograph the blank stares in the eyes nine out of ten times, if not all ten. But they will all walk around with tablets and laptops or smart phones. Then add two and two together and let your mind roam about the fact that they all have the vote! What is this World coming to? Night has just delivered a new day to the World; it is not the first time that this has happened but it is an important one for me, the Founder and sole active Member of the Jaksonian Institute of Learning. I thus speak for Self, but also for all the millions of little people that want to be called Self and wish to associate with me. A fellow name of Elon Musk is often in the News, called the Media in these days. He makes rockets and NAASA pays him 2.6 billion USA Dollars for doing so; he is also involved inTesla, a project purported to make electric motorcars a viable alternative means of transport to replace the internal combustion fuel engine. For all you know he may export these vehicles to the moon and outer space for daily commuter traffic. Elon, nogal South African born, is riding high for a South African boitjie. Nogal is a Dutch Afrikaans Sefrican word for, well, for nogal. The teachings of the Jaksonian Institute of Learning are based on the life of my late Father, born 1897 in the surroundings where I now reside in the sand-hills of the Sandveld Region, Western Cape Coastline. We are earthbound people. For us mankind’s space are these hills and the sky above as high as the clouds when they are there; even when they are not we limit our visions of space to about where the cloud-lines would be when they are there. We believe our space has been that ever since the Creation and it is not ever likely to change. Some summers are hotter than others; some winters are colder and wetter than others but we can’t change that and have no desire or intentions of ever doing so. We live from the earth and we protect it; my father did that and all our ancestors before him. We believe in People but not in Politicians. We believe in the Internet as an invention but we dread its intrusion in our private lives; we believe that television is of interest but that it doesn’t rule our lives. We believe in helping each other and to share the gifts of nature with our neighbors but we abhor the intrusion of governments worldwide in the affairs of other sovereign countries or nations. We believe in a secular government system but not a Godless one. We believe in duty, morality, honor and responsibility in everything that we do. We do not approve of Space Exploration or that there is anything to explore above the clouds; we believe that the Globe or the Earth is the only home for Mankind. We believe in our Creator and that His will be done for now and forever on earth and in the Universe around us. For more on Rednecking, just Google for it. For more of Mice and Nonsense on History read Billary’s book titled Living History; keep a vomit bag at your side. 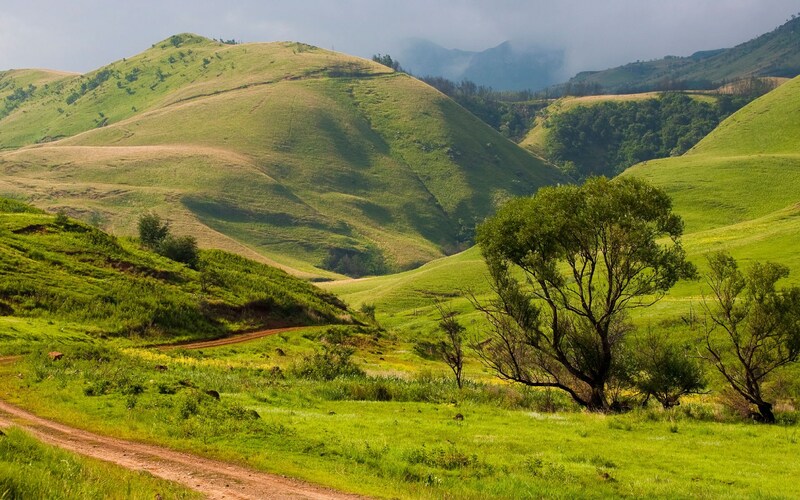 The far and never ending hills of Zululand. If we could just learn not to mess it up the way we do? Cry the beloved Country. The fine Picture is presented to you with recognition and compliments to the Old Mutual photographer. The half century from 1960 to 2010 are sometimes [well fittingly] referred to as the Change of Winds period in Africa and the past two years have not produced any signs boding well for the 50 years from 2010 to 2060. May we all keep our heads down, girth the loins and hope that things will change for the better. To all of you and with love I deliver my appreciation for friendships received, for understanding and fellowships, for support over two years of ill winds and severe turbulence in our family. God Speed to all of you. I freely admit that I enjoy satire; must secondly also admit that virtually any Academically inclined Prognosis on Financial matters give me the giggles; consequently I may as well admit that a recent Post by a South African Academic of note made me laugh so long and very loud too that my neighbors had to come in to subdue me before the police would have come to place me under arrest for laughing loudly down the streets and causing a public disturbance. Read it and spent some time browsing through the flood of comments. My learned Research Colleague obviously chose to ignore all work readily available on Colonialism and the part it played in bringing development to the World; the creation of Trade, the discovery and development of mineral resources and the benefits of education, Capitalism and International Trade between the nations of the World. He obviously also doesn’t understand that The Wealth that this brought to our land has already been distributed fair and square. He doesn’t know much of the recent History of the land either and I will enlighten him briefly, speaking from memory to avoid too many links and references to material that should be freely obtainable. Let me just summarize. Unbundling of colonialism of Africa started in full earnest in 1957 and was completed by 1980. In each and every instance the Oligarchy to take over as Government redistributed the Wealth. Allow me a few statistics from South Africa. In 1977 the personal Income tax rate for taxable incoming exceeding R 28 000 per annum was taxed at 72%; e.g. let us take a person who had a taxable income of R 328 000 in 1977. He would have paid the basic tax on the R 28 000 plus a full R 216 000 of the remaining R 300 000, thus leaving him with R 84 000 plus the remainder after tax on the basic R 28 000, probably leaving him with a total of around 100 000 bucks. Now bear in mind that in that year and all along until 1993 the country had 78 individuals in this position sometimes referred to as the Super tax Bracket for people earning more than R 250 000 per annum. They were all entrepreneurs; not a single salaried person ever got even close to that. Until 1994 that is; the new Oligarchy regime in Governance was keen to rectify the imbalances of the bad past; after all voting for it setting their own salaries at around R 60 000 for starters then moved it real fast up to R 100 000 per month. By the end of 1994 the original 78 in the Super tax Bracket had increased to about 3 000 souls; by the end of 2000 the numbers had risen to [my guess] about 10 000 souls and the salary levels to R 250 000 per month as against the old R 250 000 per annum. Old age pensions and disability income protection for the unfortunate ones have continued to grow at snail’s pace and now stands at just a little over a breadline R 1 000 per month. The original 78 were probably all Caucasian [maybe one or two exceptions] but almost the entire 10 000 new additions are all Black. By now the Oligarchy of 10 000 also practically owns the right to any new mineral exploration; they control it and have made it clear that there is no need to nationalize it because they have effective control over all mineral and mining rights in any event. Other resources such as Construction and Transportation are controlled by them too and one can anticipate that the ranks of the 10 000 may swell to around 15 000 where it will more or less stabilize and no more newcomers will be allowed in. Surely yes, at the level just below the 15 000 we have maybe another 100 000 or so drawing good salaries of between R 25 000 to R 50 000 per month but it is a limited membership. Most are black and about half will have to be female; that’s the law. Professor, Doctoro my learned Research Colleague, there is not going to be any more distribution of wealth. Five hundred thousand new learners will leave school this year with their High School certificates in hand; a few with connections and/or family in the élite group of 15 000 will go onto University and a few of them will be allowed into the privileged circle of the neo- rich as older ones die but the rest of the 2012 school leavers will join the lines of the unemployed. That’s reality, my learned colleague. The present élite 15 000 in charge of the Oligarchy Regime Governing our land will not allow any further re-distribution of any wealth. They intend to keep it for themselves, for their families and their Friends. It is already October 6th at exactly 6:18:57 AM according to my computer as I start this on the keyboard; out your way some of you are up to nine hours in the past still but I am doing it for my future reference. There is pretty little that I can do about your Election 2012; in fact I can do nothing about it but cling to my guns that I don’t have, my religion that means more to me as I mature and I don’t have it in me to say that I live with any audacity of hope. What I do know is that from one point of view it is not important whether the Bama is re-elected in a month from now or not; what is important is what the voters are going to do. Africa’s fate is sealed and cannot be changed. It is going back in grand style to what it always used to be. They always relished it and it is quite evident they are relishing the return to their old ways. Don’t let it happen to you, America. Outside Waynesville going west towards Cherokee NC there is a roadside lookout high up near the summit just before you get to the sprawling RV Park on left. In July when the heat zaps you down in Georgia I drove Jakkie up in the mountains; roof and cab aircon running all the time because it was hot. Something made me stop to admire the view. As I descended the two steps of the van and then took two steps away I had to dash back in for a windbreaker; there was a gentle fresh cool breeze blowing on my back from the north. How I would love to have been there now. Keep America good, fellows; for you, your children, and for me if I ever find a way of coming round one more time before I have to cross the river that we all must do some time or another.